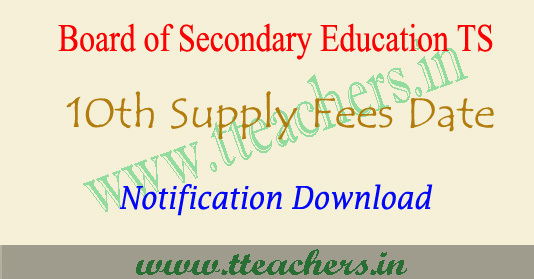 TS SSC supply fee last date 2018 10th supply exam fees details telangana :Director of government examination Telangana have been released TS SSC supply fee last date 2018, TS 10th class exam fee due dates for remittance of supplementary examinations. TS SSC supply exams held from 5th June 2017 to 19th June 2017. Earlier Education minister has announced Telangana ssc March 2018 exam results. Both Regular and Private candidates put together 5,33,701 candidates have appeared for the SSC Public Examination ), March 2018 as against 5,55,265 candidates appeared for SSC March, 2018 Examinations. Out of 5,33,701 candidates, 5,07,938 Regular candidates and 25,763 Private Candidates have appeared for SSC Examinations 427414 candidates passed in March 2018 exam. This is only a provisional list of Roll Numbers of tl e candidates who are declared eligible for the award of Secor dary School Certificate by Board of Secondary Education, Telangana State, Hyderabad. Subject wise performance statements (Grade sheets) will be given to all the candidates within 10 days to facilitate admi: sion into 1st Year Intermediate without any difficulty. SSC certif rates will be supplied to all the Passed candidates subsequently. The extraction of failed candidates of March 2018 will be dispatched to the Schools concerned within 10 days from the date of release of results. The results of a few candidates are withheld for wait. of certain information from the school/ campi Center. These Cases will be finalized and released shortly.